This introductive chapter presents the most important disruptions of concepts concerning the thymus since its discovery in Antique Greece. For centuries, the thymus was considered as a vestigial organ, and its role in T-cell differentiation was proposed only in the 1960s. Most recent studies attribute to the thymus an essential and unique role in programming central immunological self-tolerance. The basic mechanism implicated in this function is the transcription in the thymic epithelium of genes encoding precursors of neuroendocrine-related and tissue-restricted self-peptides. Their processing leads to the presentation of self-antigens by the major histocompatibility complex (MHC) machinery expressed by thymic epithelial and dendritic cells. Already during foetal life, this presentation promotes negative selection of T lymphocytes harbouring a receptor with high affinity for MHC/self-peptide complexes. Mainly after birth, this presentation also drives the generation of regulatory T cells specific for these complexes. Numerous studies, as well as the identification of Aire and Fezf2 genes, have shown that a thymus defect plays a crucial role in the development of autoimmunity. 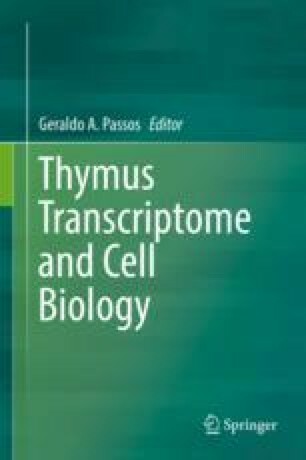 The discovery of the central tolerogenic action of the thymus revolutionized the whole field of immunology, and such knowledge will pave the way for innovative tolerogenic therapies against autoimmunity, the so heavy tribute paid by mankind for the extreme diversity and efficiency of adaptive immunity. This chapter is dedicated to the memory of Bruno Kyewski and Harald von Boehmer who passed away in 2018. The studies summarized here have been supported by the Fonds Léon Fredericq (University Hospital of Liege), by the University of Liège, Wallonia, the F.S.R.-NFSR of Belgium, the Wallonia-Brussels Federation, the Fonds Alphonse Rahier for research in Diabetology (Belgium), the European Commission (FP6 Integrated Project Euro-Thymaide 2004–2008), the European Association for the Study of Diabetes (EASD, Germany), and the Juvenile Diabetes Research Foundation (JDRF, New York). From the Brazilian side, the work has been supported by the National Institute of Science and Technology on Neuroimmunomodulation, Conselho Nacional de Desenvolvimento Científico e Tecnológico (CNPq), Coordenação de Aperfeiçoamento de Pessoal de Nível Superior (Capes) through Financial code 001, Faperj, Fiocruz and Mercosur (FOCEM).